Small sculptures of natural woods presenting strange little creatures, on a cement-base, covered with silver leaves. On a wood/iron stand. Ι was born in Patras in the 6O's. I spent my childhood sketching and drawing. Suspicious towards schooling, while at the same time. I got carried away by real life teachers, like craftsmen. In practice the school I choose to remember, after completing high school, was a factory of carnival constructions. That was the time when my everlasting love for masks was born. A while later, I started studing Byzantine Icon painting and techniques. This study gave me the knowledge of many forgotten techniques, mainly polishing gilded surfaces . After a while I started working as an assistant to painters and scenographers and I created a working place on my own. In the meantime, I had been involved in visual arts and in the application of old techniques for the maintenance of objects and furniture. I use applied arts, such as the gold polishing technique, the stucco technique, the paper masse technique. 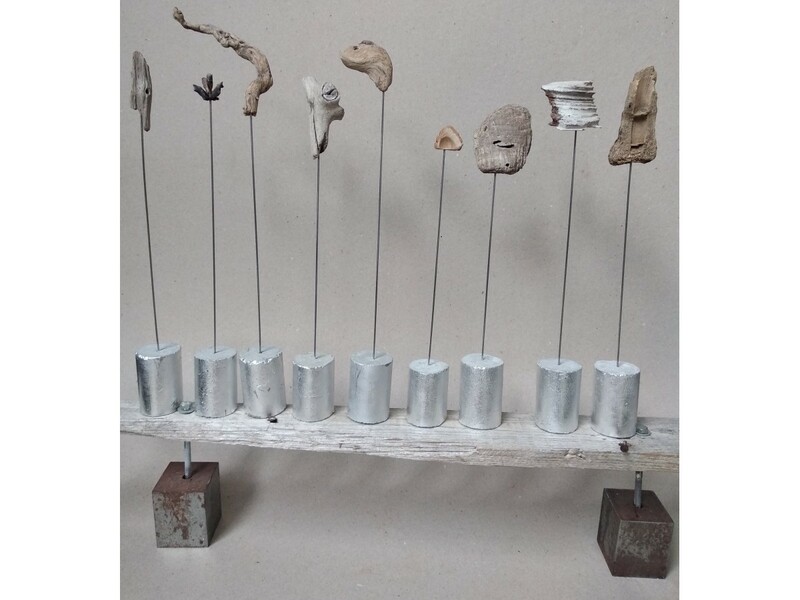 I work as a sculptor using natural materials such as plaster, paper, wood, gauze, soft wire, aluminum. I have been working for years with the Benaki Museum. I make masks, theatrical structures for performances, decorative and usable items.. I occasionally display my artworks. I have a permanent exhibition of my artworks in my workshop. I have never stopped searching for old techniques, often forgotten. I experience art as the ancient language, that connects us to the cosmic history. This is how I understand why art heals. I love the techniques of the old craftsmen,because they provide me with the sense of continuity. I only use natural materials, since as a medium, I am a natural material myself. A present to the most beautiful princess of the fairies.